Eventually, Britain conquered Burma over a period of 62 years (1824-1886) and incorporated it into its Indian Empire. It was administered as a province of India until 1947 when it became a separate self-governing colony. During the Second World War, Burma was a major battleground as the Allies fought the Japanese for dominance over Asia. The Burma Road was built to get supplies to China. The Thailand-Burma railroad (the so-called "Death Railway") from Kanchanaburi in Thailand over the River Kwai to Burma was built by the Japanese using forced labour — Allied prisoners-of-war, indentured Thai labourers, and Burmese people. They had to work in appalling conditions and a great number of them died (estimated at 80,000) during construction of the railway. Large parts of Western Burma, particularly the hilly areas bordering India and the city of Mandalay were severely damaged during the war. While the Burmese independence fighters led by Aung San initially cooperated with the Japanese to oust the British, with the Japanese promising to grant independence to Burma in exchange, it soon became apparent that the Japanese promises of independence were empty. The Japanese occupation was more brutal than the British colonisation, and many Burmese were killed, such as in the Kalagong massacre. Aung San subsequently switched allegiance and helped the British win Burma back from the Japanese. Aung San subsequently led negotiations with the British for Burmese independence after the end of World War II, and the British agreed in 1947 to grant independence to Burma the following year, though Aung San himself was assassinated later in the year and never lived to see his dream come true. Independence from the British under the name Union of Burma was finally attained in 1948, and till this day, Aung San is regarded by most Burmese people to be the father of independence. The new union brought together various states defined by ethnic identity, many of whom had centuries-long histories of autonomy from and struggles against each other. In the interest of securing their collective independence from Britain, the tribes reached an agreement to submit to collective governance—with power sharing among the ethnicities and states—for ten years, after which each tribe would be afforded the right to secede from the union. The terms of this "Panglong Agreement" were enshrined in the 1947/1948 constitution of the new Union of Burma. The new central government of the nation quickly worked to consolidate its power, marginalizing and angering tribal leaders and setting off more than a decade of armed conflict. In 1961, more than 200 ethnic leaders from the Shan people, Kachin people, Red Karen, Karen people, Chin peoples, Mon people and Rakhine people met with ethnic Bamar (Burmese) central government authorities to draft a new form of government which would ensure the tribes both autonomy and self-determination within a federal system. The new government was never formed. Military leader General Ne Win led a coup d'état which ousted the democratically elected government in 1962, and subsequently installed himself as leader. General Ne Win dominated the government from 1962 to 1988, first as military ruler, then as self-appointed president, and later as political kingpin. Pro-democracy demonstrations in 1988 were violently crushed, with general Saw Maung taking over in a coup and installing the State Law and Order Restoration Council (SLORC) to rule the country, now renamed Myanmar. The summer of 2007 was marked by demonstrations against the military government which were again brutally suppressed. The demonstrations started in August, apparently in an uncoordinated manner, as a protest against a stiff hike in the price of petrol, but morphed into a more serious challenge to the government after three monks were beaten at a protest march in the town of Pakokku. The monks demanded an apology but none was forthcoming and soon processions of monks with begging bowls held upside down filled many cities (including Sittwe, Mandalay, and Yangon). Yangon, particularly the area around Sule Pagoda in the downtown area, became the centre of these protests. While the monks marched, and many ordinary citizens came out in support of the monks, the world watched as pictures, videos, and blogs flooded the Internet. However, the government soon suppressed the protests by firing on crowds, arresting monks and closing monasteries, and temporarily shut down Internet communications with the rest of the world. This led the USA, Australia, Canada and the European Union to impose additional sanctions, some targeting the families and finances of the military leaders. Following elections in 2010, Burma began a process of liberalization that has led to a reduction or removal of sanctions by many nations including the United States. In 2012, Aung San Suu Kyi was elected to the Burmese parliament and allowed to travel to Europe and North America. Censorship of foreign and local news has also been suspended. Myanmar's culture is largely a result of some Indian influences intertwined with local traditions and some Chinese influences. This can be seen in the various stupas and temples throughout the country, which bear a distinct resemblance to those in northern India. As in neighbouring Thailand, Theravada Buddhism is the single largest religion. 89% of the population follows these Buddhist practices, and even some of the most remote villages will have a temple for people to pray at. Other religions which exist in smaller numbers include Christianity, Islam and Hinduism. Animism and ancestor worship can also be found around the country, especially in the more distant, hill tribe regions. The dominant ethnic group in Myanmar is known as the Bamar, from which the original English name of the country, Burma, was derived. Besides the Bamar, Myanmar is also home to many minority ethnic groups and nationalities which have their own distinct cultures and languages. In addition to the native ethnic minorities, Myanmar is also home to ethnic Chinese and Indians whose ancestors migrated to Myanmar during the colonial period, most visible in the cities of Yangon and Mandalay. Generally speaking, the regions in Myanmar are Bamar-dominated, while the states are dominated by the respective ethnic minorities. Myanmar is a presidential republic, with the president, who is appointed by the legislature, serving as both head of state and head of government. He and his cabinet form the executive branch. The legislature is composed of the bicameral Assembly of the Union, consisting of an upper Amyotha Hluttaw (House of Nationalities), and a lower Pyithu Hluttaw (House of Representatives). While a majority of the members of the legislature are popularly elected by the people, a significant minority of the seats are reserved for appointees from the military. Citizens of Brunei, Cambodia, Indonesia, Laos, Philippines, Thailand and Vietnam may enter Myanmar without a visa for a stay of up to 14 days, provided they enter by air. This 14 day stay is strictly not extendable for any reason. All other nationalities are required to apply for a visa in advance. Some additional restrictions, requirements or conditions may be applied to applications. Reports have included a need for a detailed itinerary, a detailed job history, etc. Be prepared for some unusual questions (either on the forms, or from the consulate staff) when applying for your visa. Myanmar's E-Visa Online is fully operational as of September 2014. To apply for a Visa you need a digital photo of you (check requirements), $50 and provide an address in Myanmar. It takes up to 3 workdays and then an "Entry Visa Approval Letter to Myanmar" is emailed to you. Alternatively, there is another option to get your coveted Myanmar visa and that is to use the services of an organisation like Evisa Asia. This way, you won’t even need to visit a Myanmar embassy. The Ministry of Foreign Affairs, through the Ministry of Hotels and Tourism, issue the approval letter online. You must enter Myanmar through international airports and not through the border. Visa sticker will be stamped on your passport on arrival. A same-day visa can be issued at the Myanmar Embassy in Bangkok. To get the visa the same day, you must tell the visa clerk that you are leaving tomorrow. They will issue your visa later that same day by 15:30, valid starting the date of issue. Myanmar has announced the resumption of Visa On Arrival (VOA) for business visas, starting in Jun 2012 for several countries including all ASEAN member states. Despite reports saying that the government has reintroduced VOA for tourists, as of Jun 2012, all tourists must apply via embassies. The easiest way to get the visa is to apply through a travel agency in your home country. The form is simple and requires an ID photo or two. In Bangkok, it takes one or two business days. A standard application for a tourist visa requires: a completed visa form (available from the embassy), a completed arrival form (again, from the embassy), a photocopy of the photo page from your passport, two passport sized photos, the applicable fee (810 baht/USD24). In Hong Kong, you can get the visa by applying between 09:00-12:00, and picking it up after 15:00 on the following business day (your passport, 3 passport photos, business card / leave letter from your employer or student ID if you're a student, and application fee of HK$150/USD19). Myanmar's main international airport is located at Yangon, the largest city and main economic centre. There are regular scheduled flights from Yangon to several major cities in China, India and Southeast Asia. For travellers from outside the region, the easiest way to get into Myanmar will be to catch a flight from either Singapore or Bangkok, both of which have good connections to cities around the world, and are served by several flights into Yangon daily due to their large overseas Burmese populations. Myanmar also has a second international airport at Mandalay, which is served by several flights from China and Thailand. Myanmar has land borders with five different countries, namely China, India, Bangladesh, Thailand and Laos. As of 2013, restrictions on foreigners entering via the Thai border have been lifted, and foreigners are free to travel overland from Thailand into the Burmese heartland provided their Burmese visa is in order. Entering Myanmar from the other land border crossings, though, is a different story. At the very least, you will need to apply for special permits in advance, and you may need to join a guided tour in order for the permit to be granted. Thailand - Four border crossings exist between Myanmar and Thailand at Tachileik/Mae Sai, Myawaddy/Mae Sot, the Three Pagodas Pass (Payathonzu/Sangkhlaburi) and Kawthoung/Ranong. As of 2013, all four border crossings are open to foreigners, and there are no restrictions on foreigners travelling into the Burmese heartland from any of the four border crossings. No visa-on-arrival is available though, so ensure that your Thai (if required) and Burmese visas are in order before attempting this. Mandalay to Kunming, and there's even a Chinese consulate that issues visas in Mandalay. India - A land border crossing exists between India and Myanmar at Moreh/Tamu. While there have been confirmed reports of some travellers crossing into Myanmar from India, with their own transport as well as with permits arranged in advance, the general consensus is that obtaining all the necessary permits is very hard. At the least, a foreigner (a person who is neither a citizen of India nor a citizen of Myanmar) will need to get an Indian permit to visit the state of Manipur, and an MTT permit to enter or leave Myanmar at Tamu. Travellers may also need a permit to travel from Tamu to Kalewa, although there are unconfirmed reports that this is no longer required. Bangladesh - it is not currently feasible to independently cross the border between Myanmar and Bangladesh. Myanmar's infrastructure is in poor shape. As a result of the political situation, Myanmar had until recently been subject to trade sanctions from much of the western world, and this can cause problems for unwary travellers. Travel to certain regions is prohibited; for others, special permits must be obtained, and a guide/interpreter/minder may be mandatory - although whether these "guides" accompany you to look after you, or to keep you from going to places the government doesn't want you to see, is moot. Mrauk U Chin/ Zomi village tours. Easily available in Mrauk U, but must visit with a guide. Your hotel or a local tour company can arrange this for you. Myanmar is not North Korea, and you are free to walk around, go to shops and interact with the locals. That being said with many of the more far flung places, and places restricted to foreigners it is better to arrange your internal visa in advance. State-run Myanma Airways (UB), not to be confused with Myanmar Airways International (8M) "MAI" - is known for its poor safety record. Even locals prefer to avoid it whenever possible. The private airline companies are usually on time, and even depart early (10-20 min), so be on time and reconfirm your flight and flight time 1–2 days before departure. Sometimes the itinerary might be altered some days before departure (meaning that you will still fly to your final destination on the scheduled time, but with an added or removed in between stop, e.g., Yangon-Bagan becomes Yangon-Mandalay-Bagan). This usually only affects your arrival time. En route stops have only 10-20 min ground time, and if it is not your final destination, you can stay inside the plane during the stop. Important for Yangon: Yangon International Airport serves all domestic flights from the old terminal building. This building is about 200 m further on the road than the main (new) Yangon International Airport building. When taking a taxi from downtown to the airport, mention to the driver that you are on a domestic flight so you'll not end up in the wrong terminal. Myanmar has an extensive and ancient rail network. Trains are slow, noisy, rocking left and right, leaving extremely punctual but than often delay on the trip. Electrical blackouts are becoming rare but nonetheless never assume that air conditioners, fans or the electrical supply itself will be working throughout the whole journey. Most trains have upper class and ordinary class. Ordinary class has wide open windows, benches and can be packed with locals transporting their goods. Upper class has upholstered chairs, fans and is less crowded. Never put your head out of the window as it is very likely to be hit by a branch. Vegetation grows so close to the tracks that you normally find a good amount of shredded leaves on the seats. Tickets are cheap and tourists pay the same price as locals. But note that tourists still cannot buy tickets on the train nor in small train stations. Only big stations have the special English tickets and your passport is required when purchasing. A journey on a train is a great way to see the country and meet people. The rail journey from Mandalay, up hairpin bends to Pyin U Lwin, and then across the mountains and the famous bridge at Gokteik, is one of the great railway journeys of the world. Trains in lower Mandalay, Yangon-Pathein and Yangon-Mawlymaing, are little communities of their own with hawkers selling everything imaginable. Sleepers are available on many overnight express trains, although in the high season you may want to reserve a few days in advance. The Yangon-Mandalay trains now operates in the daytime only, apparently because the government does not want trains passing Naypyidaw at night. Food service is available on the express in both directions between Yangon and Mandalay, as well as on the Yangon-Mawlamyine routes. Except for the new bridge and rail line that connects Mawlamyine to points on the west side of the Salween River, the rail network is exactly the way it was in British times. The most used line is the 325 km line from Yangon to Mandalay with several trains a day. It is the only double line in Myanmar, and also the only one that is competitive in time with buses. Note, that the fastest trains take 15 hr for the 385 km run, an effective rate of 25 km/hour. A second line connects Yangon with Pyay, 9 hr for the 175 km journey, with a branch heading off into the delta region town of Pathein. These tracks, the earliest constructed, are in poor shape. With the construction of the bridge across the Salween, it is now possible to go by train from Yangon to Mawlamyine , 8 hr for the 200 km journey, and on to Ye although it is closed to foreigners. From Mandalay, trains continue on to Myitkyina in Kachin State, 350 km in 24 hr, and to Lashio. There are also rail connections between Yangon-Bagan and Mandalay-Bagan, but bus or ferry are better alternatives: the 175 km from Mandalay to Bagan takes 10 hr. The adjoining table summarizes travel time and prices between some popular places in Myanmar. Note: Train tickets cannot be paid in USD any more. Buses of all types ply the roads of Myanmar. Luxury (relatively speaking) buses do the Mandalay-Yangon run while lesser vehicles can get travellers to other places. Fares are reasonable and in kyat and buses are faster than the trains. Many long distance buses assign seats, so it is best to book seats at least a day in advance. Because the roads are bad, avoid the rear of the bus and try to sit as far up front as you can. Long distance buses also have an extra jump seat that blocks the aisle and, because it is not well secured to the chassis, can be uncomfortable (which also means that there is no such thing as a side seat where taller travellers can stretch their legs). A window near the front of the bus is always the best option. Even budget travellers will find themselves buying more tickets via their hotel or an agency rather than really going to the bus company to buy it directly. Their offices are often located far from any tourist place and the cost of going there and back will most likely exceed the commission your hotel will get for selling you the ticket. But make sure to shop around and compare prices before buying your ticket as some vendors include a free pick-up from your hotel. A scam about bus tickets seems to be popular in Yangon currently. While many travellers make a stopover in Bago, they are told at their guesthouse or at the bus station it's not possible to buy tickets there in the direction to Mandalay. In a country where everything might be possible when it comes to transport, some people fall for this. Actually, this is not the case and tracking back to Yangon for a bus ticket up north is not necessary at all. Bago has a bus terminal with several bus offices. Buying your ticket at Bago might be slightly cheaper (depending upon your bargaining skills) and gives you more freedom for the rest of your journey. The adjoining table summarises travel times and approximate fares between important tourist destinations in Myanmar (Note: most bus fares have gone up with the recent fuel price rises, the fares listed here are rough estimates). The basics of pickups are fairly straightforward, wait till it is reasonably full before heading out. On well-travelled routes (Mandalay-Pyin U Lwin, for example), they fill up quickly and the journey is quick. On less well-travelled routes (Bhamo-Katha, for example), passengers arrive (early, usually around 06:00), mark their place, and then hang around drinking tea and chatting until the truck fills up. When the pick-up does get moving, it may linger or go out of its way in the hope of picking up more passengers. The inside of a pick-up can be hot and uncomfortable. Passengers, packed in like sardines, face away from the windows (which are tiny) and into the truck. Standing on the running board can be tiring and tough on the arms! On the other hand, the window side seat next to the driver is very comfortable and well-worth the little extra that you have to pay, so it is best to go early and reserve that seat. Myanmar is a former British colony, and as a result - and because English is still compulsory in kindergartens and primary schools - many Burmese understand at least some rudimentary English. Most well-educated upper class Burmese are fluent in English, while in the main cities like Yangon and Mandalay, many locals will know enough English for basic communication. Hotel and airline staff, as well as people working in the tourism industry generally speak an acceptable level of English. You may find more English spoken in Myanmar than in Thailand. Myanmar has not been on the hit list of many travellers through Southeast Asia, and it's difficult to understand why. The country is a true, unspoiled treasure trove, and should capture the imagination of anyone interested in culture and history. Walking around Yangon brings you back to the time of 19th century British colonial rule. Sparkling-clean parks and temples stand side by side decayed colonial-style buildings and deep potholes. Its cultural and religious attractions, like the Shwedagon Pagoda, add to the city's feel of exoticism, as do the smiles of the locals. Every street corner brings something new—and a short ferry over the river even gives you a glimpse of rural life in the country. Cities of cultural and historical interest close to Yangon are Bago with its Buddhist sights, the delta town of Twante known for its pottery, and the pilgrimage site of Kyaiktiyo with its gold-gilded rock balancing precariously over a cliff. It's definitely worth it to further explore the Bamar heartland—unfortunately the outer fringes of the country are off-limits to foreigners. The former city of Bagan is a true gem, and gives a glimpse of what life in the 11th and 12th centuries here must have been like. Marco Polo described it as the "gilded city alive with tinkling bells and the swishing sounds of monks' robes". It is the largest and densest concentration of Buddhist temples, pagodas, stupas and ruins in the world. Mrauk U is another one of those mysterious places—a sleepy village today, its crumbling pagodas and temples remind of the early modern period, when it was the capital city of an empire involved in extensive maritime trade with Portuguese, Dutch, French and Arab traders. Within daytripping distance from Mandalay is Inwa, another former capital where ruins remain to remind visitors of its former glory. Also don't miss Pyin U Lwin, a former British hill station with somewhat cooler temperatures. The country has its fair share of natural attractions. Inle Lake is where the backpacker community resides, and it is one of the few places that is starting to feel like a tourist trap. 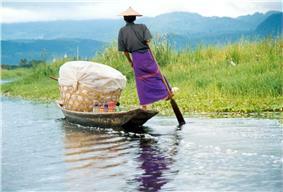 Still, a trip to Myanmar is not complete without a boat trip on the lake. It has a unique vibe with tribes living in stilt houses and paddling their traditional wooden boats with one leg. The country's long southwestern coastline also has a few beaches, such as Chaung Tha and Ngapali. If you visit outside of the traditional holiday season, you might just have a beautiful white sand beach for yourself. Only two years later, on 5 Sep 1987, the government once again demonetized the 25, 35, and 75 kyat notes with no prior warning, rendering some 75% of the country's currency worthless. A new series of 15, 45, and 90-kyat notes was issued, incorporating Ne Win's favourite number 9. The resulting economic disturbances led to serious riots and eventually the 1989 coup by General Saw Maung, The post-coup notes come in more normal denominations from 1 to 1000 kyat, and this time the old ones remain legal tender, so far. Myanmar's currency is the kyat, pronounced "chat". Prices may be shown locally using the abbreviation of K (singular or plural) or Ks (plural) either before or after the amount and depending very much on who is doing the sign writing. The ISO abbreviation is MMK. Pya are coins, and are rarely seen since their value has become increasingly insignificant with even the largest 50 Pya coin worth less than six US or euro cents in Feb 2014. Foreigners are no longer required to pay in US dollars for hotels, tourist attractions, rail and air tickets, ferry travel and for bus tickets. As of September 2015, foreign currency instability and the weakening kyat means that many venues will state prices in US Dollars, even though it is currently illegal to quote prices in USD. Expat restaurants still often quote in USD despite recent actions from the Central Bank prohibiting excess dollar usage. According to law, it is illegal for a Myanmar citizen to accept (or hold) US dollars without a licence but this law is mostly ignored and US dollars are generally accepted. Never insist though because it may be dangerous for the receiver. FECs are still legal tender but are rarely seen and are worth very little. Kyat officially cannot be exchanged abroad, though money changers in places with large overseas Burmese populations such as Singapore will often exchange anyway. Bring very clean, unfolded US dollars (or they will not be accepted by hotels, restaurants and money changers), and dispose of remaining kyat before leaving. When exchanging dollars to kyats, be aware that even small imperfections can be cause to reject a note. Keep all US Dollars in impeccable condition, and do not fold them. Especially on holidays and Sundays, all your necessary money should be changed at the airport as banks in town are closed. Money changers offer a significantly lesser rate (5-10% lower) for changing US dollars. The most hassle-free option is to change all your required money at the airport, as you can also change it back for a negligible fee. Look around different banks for the best exchange rate. Currency controls have been relaxed in recent times, and banks no longer exchange foreign currencies at the ridiculous rate they used to. Most banks accept US dollars, euros and Chinese yuan. Singapore dollars and Thai baht can also be changed at some of the larger banks. USD100 bills give the best exchange rate at banks. Changing USD50 or USD20 notes gives you a slightly worse rate of MYK10-20 fewer per dollar. Kyat banknotes The notes of MYK50, MYK100, MYK200, and MYK500 are most of the time in a horrible condition, but are generally accepted when making small purchases. The MYK1,000 notes are slightly better, and when exchanging dollars into kyat, check that the banknotes you receive are in a generally good condition. If the exchange gives you kyat notes in horrible condition, you can ask them to exchange them for notes in better condition. Some moneychangers will also attempt sleight of hand tricks to either swap your good banknotes for damaged, or lower denomination notes. Other reports suggest that the kyats may be counted and then somehow, some disappear from the table during the transaction. For example, after going through an elaborate counting process for piles of ten 1000 kyat notes, some money changers will pull some notes out as they count the piles of ten. Visitors to Myanmar were previously required to change USD200 into FECs upon arrival, but this was abolished in August 2003. FECs are still valid tender but should be avoided at all costs as they are no longer worth their face value (although a one FEC note has good souvenir potential). There are plenty of ATMs all across the country accepting international Visa and MasterCard. The bigger and more touristic the place the more ATMs it has. Upmarket tourist places (hotels, agencies, restaurants) are already accepting credit cards (and will surcharge accordingly). So you can even pay with mastercard in a store in the middle of Inle Lake for purchases value more than USD100. But nonetheless paper money is the only way to pay in most places. If an ATM doesn't work simply walk to the next one. In case you are going to a remote area withdraw beforehand in a city. Usual withdrawal limit is MYK300,000 with a processing fee of MYK5,000. Beside the ATMs, there are places where cash can be obtained with a credit card, but the rates are extremely uncompetitive (with premiums certainly no lower than around 7%, and with quotes of 30% and more frequently reported). In case you run out of money, ask your taxi driver to drive you to the CB Bank ATM. It's not possible to be comfortable on less than USD25/day (May 2013). Foreigners will likely be charged fees, including video camera, camera, entrance, parking and zone fees. Most managed tourist site charge for carrying cameras of any sort into the area. Double rooms with private bathroom are nearly always more than USD20, in Yangon a double room without bathroom costs USD20. Dorm beds are around USD10 (or USD8 if you accept to loose a lot of value)(Sept.2015). While you cannot save on accommodation, you can save on food. Street food can get as low as USD0.30 for 2 small curries with 2 Indian breads, USD1 for a normal (vegetarian) dish. Even in touristy places like Bagan dishes cost under USD1 (vegetarian) and USD2 (meat). A draught Myanmar beer (5%) is around USD0.60 (600 kyat), a bottle of Myanmar beer (650 ml) is around USD1.65 (1,700 kyat), a bottle of Mandalay beer (6.5%, 650ml) around USD1.20 (1,200 kyat). Art. The Myanmar Art market has exploded in recent years, with local artist's works going for good values in Yangon and Mandalay. Visit the numerous galleries in Yangon to get a feel for available works. Art is often related to Buddhism and the difficult socio-political situation, as well as more traditional Victorian-influenced subjects like markets, old women smoking cigars, tribal members, and monks. There is a lot of cheap/mass-painted and derivative works at Bogyoke Market. Gemstones. Myanmar is a significant source of jade, rubies and sapphires (the granting of a licence to the French over the ruby mines in Mogok was one of the causes leading to the Third Burmese War) and these can be obtained at a fraction of what it would cost in the West. Be warned, however, that there are a lot of fakes for sale amid the genuine stuff and, unless you know your gems, buy from an official government store or risk being cheated. Bogoyoke Aung San Market and the Myanmar Gems Museum in Yangon has many licensed shops and is generally a safe place for the purchase of these stones. Burmese food is influenced by that of India and China, yet has its own uniqueness. Apart from Burmese food, other ethnic traditional foods such as Shan food, Rakhine food, and Myeik food are also distinct. Rice is at the core of Burmese food, and good vegetarian food is widely available. Burmese food is often extremely pungent. Similar to neighbouring Southeast Asian countries, fish sauce (ငံပြာရည် ngan bya yay) is a very popular condiment in Myanmar, and is widely used to flavour many dishes. Food is inexpensive at most restaurants (priced at MYK500-3,000 per item at most local restaurants, but can go as high as MYK8,000 at posh restaurants). There are many up-market restaurants in Yangon and Mandalay. Laphet thote (pronounced la-peh THOU): A salad of fermented tea leaves and a variety of fried nuts. It is commonly mixed with sliced lettuce, and is eaten with rice. The dish originally comes from Shan State. Teahouses are important places of social gathering and popular throughout the country. They look like restaurants but if you watch closely you will notice that people are drinking a lot of Chinese tea (free), light brown tea and are mainly snacking. Some teahouses also offer simple dishes as fried rice or noodles. If you are not sure simply ask for the Lapae yeah zein. Note that you will completely mispronounce the tea names (second and sixth are relatively easy) and people might not get what you want at all since it's rare for foreigners to order these teas. So it's better to ask your hotel or any local speaking English to write down the names in Burmese. Since you are a foreigner they will assume that you want your tea sheh - special - which means it will come with condensed milk. It's also possible to order a tankie and so the tea will come in a big pot. A simple cup of tea costs between MMK200-400. Small snacks like samosas, cakes or sweet balls are readily available at the table. If not ask. At the end you will only pay for the number of pieces eaten. Foodies should check out the type of snacks before deciding on a teahouse. It is not impolite at all to bring your own food as long as you order at least something. While not as inexpensive as neighbouring Thailand, Myanmar has surprisingly good hotel accommodation at reasonable prices. Rooms with attached bath are available for under USD10 everywhere except in Yangon and with shared bath for anywhere from USD3–6 in most places. Almost every hotel licensed for foreigners has running hot water (though, in remote areas, availability may be restricted to certain hours of the day). Hotels, with a few exceptions, are usually clean. At the budget end, sheets and blankets may be threadbare and the rooms may be poorly ventilated. A few low-end hotels, particularly in Yangon and other large cities, specialize in cubicle rooms, small single rooms with no windows which, while cheap and clean, are not for the claustrophobic. Rates are quoted as single/double, but the rooms are usually the same whether one person or two stay in the room, making good hotels a real bargain if travelling as a couple. Except at the top-end, breakfast is always included in the price of the room. Unfortunately, the recent tourism boom in Myanmar has left its infrastructure struggling to cope with the increased numbers of visitors. Hotel rooms tend to sell out really fast, and those in popular tourist destinations often sell out months in advance. As a result of the lack of supply, prices have also increased substantially in recent times. Needless to say, you should make your hotel bookings way in advance of your planned trip to Myanmar in order not to be stranded when you arrive. Despite traditional taboos against it, begging has become a major problem in the main tourist areas such as Bago and Bagan. Children and "mothers" carrying babies are often the ones who beg as they are more effective at soliciting pity. Note that most beggars are part of larger begging syndicates or just after easy money, as tourists are usually seen to be rich. In addition, the poor can always obtain food for free from the nearest monastery if they can't afford to pay for it, so begging is not necessary for their survival. If you choose to give, note that most Burmese earn only USD40 a month doing manual labour and so giving USD1 to a beggar is very generous. Theravada Buddhism is the main religion in Myanmar, and it is customary for monks to go on alms rounds in the morning. Monks will never ask for donations from foreigners. Unfortunately, there are also many bogus monks who hang out around the main tourist attractions preying on unsuspecting visitors. Be aware that alms rounds are solely for the purpose of collecting food, and that genuine monks are forbidden from accepting, or even touching money. Authentic monks are often found in single file lines with their alms bowls, if you see a single monk requesting money from foreigners he is a fraud. You can find many fake monks in the area around Bogyoke Market. The price of computers and a home internet connection is prohibitive, so most people surf at Internet cafés. However, recent mobile operator licenses have allowed many people in cities to go online for the first time. Facebook and Viber are the most used apps and services in Myanmar. The government records screenshots every five minutes from PCs in Internet cafés to monitor Internet usage. If you don't want your privacy violated in this way, save your surfing for Thailand or wherever you head next. And the Internet speed is terribly slow, so forget about YouTube or any video streaming. Myanmar was under strong military rule for the past 40 years only ending in 2012), with a reputation for repressing dissent, as in the case of the previous house arrests of democracy campaigner Aung San Suu Kyi. There used to be more than 1,500 political prisoners (sentences of 65 years and hard labor in remote camps were given to leaders of the Saffron Revolution). Some have been released in more recent times. When in Myanmar, abstain from political activities and don't insult the government. However, in recent months, liberty in general has increased by a small but perceptible amount under the new government. A few politically critical articles have been published in government newspapers and a satirical film deriding the government's film censorship policy has been released, neither of which would have been possible in 2010. Returning visitors to Myanmar may find that locals have become ever so slightly more open to discussions regarding politics. Hygiene in Myanmar may seem terrible to the average Western traveller but it is possible to stay healthy with some basic precautions such as prophylactic medication, care choosing food and water, and antibacterial ointment. Never drink tap water. Restaurants are legally required to use ice made and sold by bottled water companies, so ordering ice is usually safe in major places. Always drink bottled water and check that the cap is sealed on, not simply screwed on. Diseases such as dengue fever, Japanese encephalitis and malaria are endemic. Drug-resistant strains of malaria and tuberculosis are common in many areas. Hepatitis vaccinations are highly recommended and cholera oral vaccine is worthwhile. At the dinner table, Burmese use a spoon and fork, or their fingers when this is more convenient. You might feel better rinsing all of them before meals. Antibacterial wipes or alcohol hand-rub is a good idea at regular intervals. Unlike in many other cultures, there is generally no concept of a family name, patronymic or matronymic in Burmese culture, and most individuals only have a given name. For example, the current President, Thein Sein, only has a given name with no family name, patronymic or matronymic, and would be addressed as Mr Thein Sein by most English speakers. Often, a Burmese honorific, usually U (ဦး) for men or Daw (ဒေါ်) for women, may be added to the beginning of the name, so he may be addressed as U Thein Sein. Avoid t-shirts with images of Buddhas or Buddhist imagery, which is considered highly disrespectful. Folks are forgiving about it, but one should not look like a bigger fool than is necessary. When praying or paying respects, it is important to ensure that the *soles* of your feet do not point towards the Buddha or anyone else. However, statues are arranged so that won't happen unless you get acrobatic about it. Tuck your feet underneath you when kneeling at shrines and temples.